Click "Add" button in "Accounts" and "Private Notes" respectively, then different add interfaces will appear. 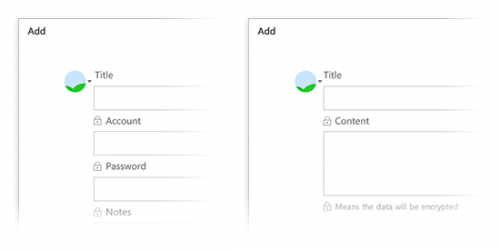 "Accounts" support to type title, account and password. It's convenient to record user names and passwords for every website and app. "Private Notes" support to type title and contents without the limit for format, allow to input bank information, identifying information, security information and other private contents.